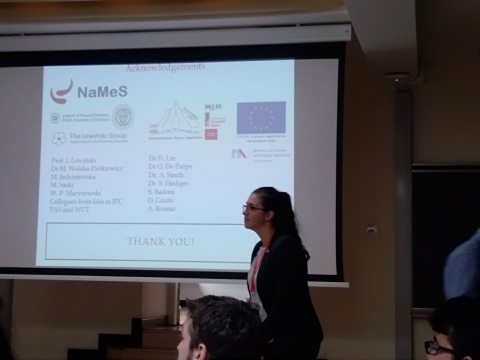 Natalia Olejnik, participated in the fall session of European Materials Research Society (EMRS), organized at Warsaw University of Technology (WUT). She attended consisted of 21, separate, symposia in different topics related to materials science. The meeting Natalia chose to attend pertained to advances in nanoparticles: synthesis, characterization, theoretical modelling, and applications. Since her research is strongly focused on nanomaterials in particular their synthesis and characterization witch advanced methods, this conference provided a full opportunity for practice and constructive dialogue. It was also an ideal platform for sharing the early results of her work as it was an international forum, constructed of researchers, education scientists, technologists and industry representatives who are experts in the field. During the conference Natalia Olejnik presented a communication entitled “Dynamic nuclear polarization enhanced solid-state NMR as a powerful tool for surface investigation with sub-Ångstrom resolution”. Additionally, she was able to participate in poster sessions and lectures not only in her symposium, which opened new ways to network and learn.